Join us on Friday, May 8, and Saturday, May 9, 2015, for the Law Union of Ontario’s Annual Conference! 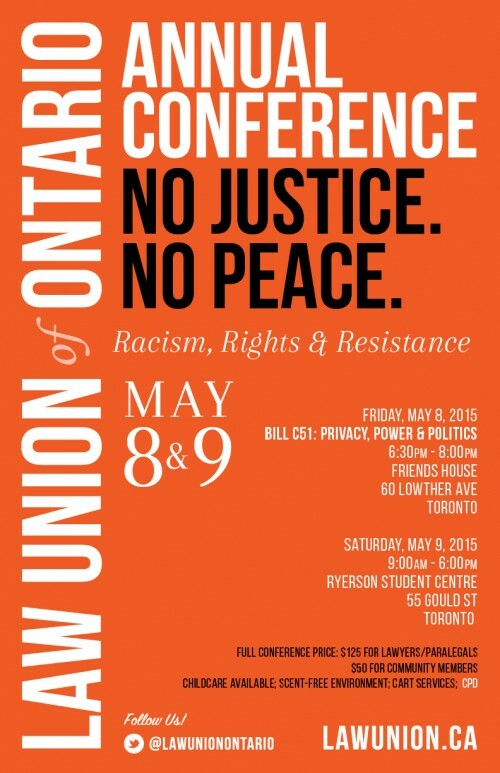 The Law Union of Ontario’s Annual Conference brings progressive legal and activist communities together to discuss an exciting and challenging series of pressing issues. Accessibility: This facility is wheelchair accessible through the parking lot door (east side of the building through from the Bedford entrance) and childcare will be provided. Accessibility: This facility is wheelchair accessible and childcare will be provided. CART (Communication Access Real Time Translation) services will be provided for all plenaries and select panels. CPD Accreditation: The Law Union Conference has been accredited for 30min Professionalism Content. The Conference is also eligible for up to 9hr 15min Substantive Content. CONFERENCE SCHEDULE – COMING SOON! Childcare will be provided – please email us in advance at law.union.of.ontario@gmail.com with the number and ages of the children who will be attending.